The Sasol Bursary Scheme is a talent based scheme, where, only applicants who meet the minimum criteria will be invited to a selection interview. It comprises a comprehensive package that covers both financial as well as developmental support throughout the study period. All applications are done electronically, not only to speed up the selection process but also to ensure fairness and electronic tracking of applications received within a particular period. Applications for a Sasol bursary close on 28 February 2013. Should you meet the minimum academic requirements specified under ‘how do I qualify’, please register to apply. Who Should Apply For Sasol South Africa Bursary? What criteria must I meet to be able to apply for a bursary? A minimum of a Level 4 for English First Language or a Level 5 for English Second Language in Grade 11. (The majority of academic textbooks used at university are imported from overseas and are thus published in English). A minimum of a level 7 for Mathematics and a level 6 in Physical Science in Grade 11 if you are applying for a bursary in one of the engineering fields. A minimum of a level 6 for Mathematics and a level 5 in Physical Science if applying for a bursary in engineering Science. Applications must be for full-time studies towards an academic degree at an accredited South African university. 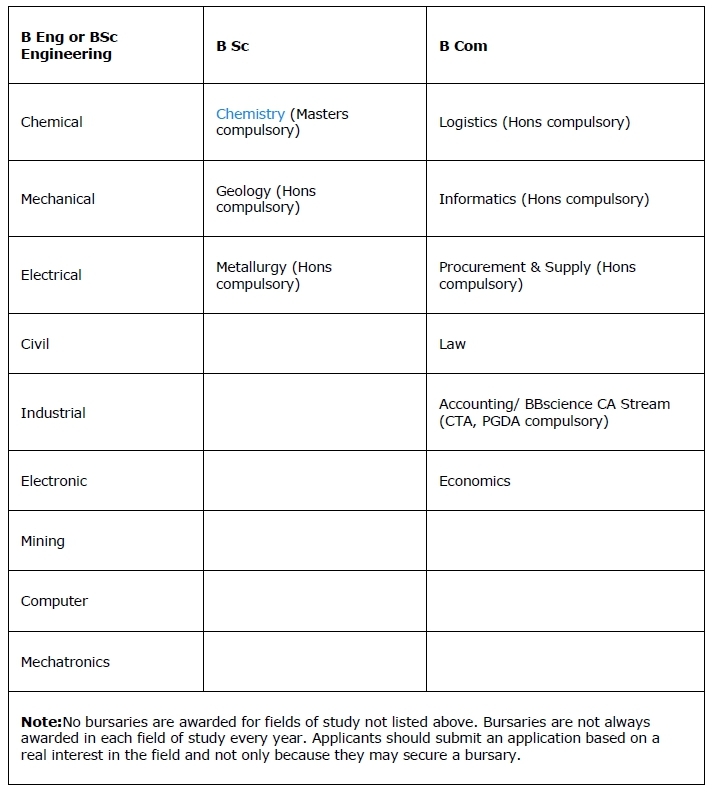 No bursaries are awarded for studies at a university of technology or college. A minimum of a D symbol for English First Language HG or a C symbol for English Second Language HG in Grade 12. (The majority of academic textbooks used at university are imported from overseas and are thus published in English). A minimum of an A symbol for Mathematics HG and a B symbol for Physical Science HG in Grade 12 if you are applying for a bursary in one of the engineering or science fields. A minimum of a C symbol for Accounting HG in Grade 12 if you are applying for B Com Accounting. Applications should be submitted to Sasol by no later than 28 February 2013, for the 2014 academic year. Applications should be submitted online by using this website. Applicants who do not have internet access and do not have access to an internet cafe in their area may contact our Sasol Bursary Application Helpline at 086 010 6235 for support. All applicants short listed to attend an interview will be notified before mid March. Notification is done telephonically as well as via written correspondence. Selection interviews normally take place during the March/April public school holidays each year. Applicants will be required to attend a full day session where they will be assessed by means of a structured interview as well as psychometric tests. The outcome of the selection day is communicated to applicants by mid-May. Please note that no correspondence will be entered into prior to this date. Successful candidates will be provided with comprehensive documentation relating to the Sasol Bursary Scheme, as well as a written contract and other documentation for completion. NB: Applications should be submitted to Sasol by no later than 28 February 2013, for the 2014 academic year.